Sculpture Size: 3 X 2 in. Sculpture Size: 4 X 5 in. Sculpture Size: 5 X 7 in. Sculpture Size: 16 X 12 in. For people of the Far East, Turtle's shell represents Heaven and it's underside the Earth, making Turtle the keeper of the gateway between all dimensions. A reminder of constant and unnerving progress, perseverance and patience, Turtle teaches us the consistency of Nature's rhythm and the irrelevant perception of time. Regarded as the ancient animal symbol for Mother Earth, Turtles are considered healers and protectors. 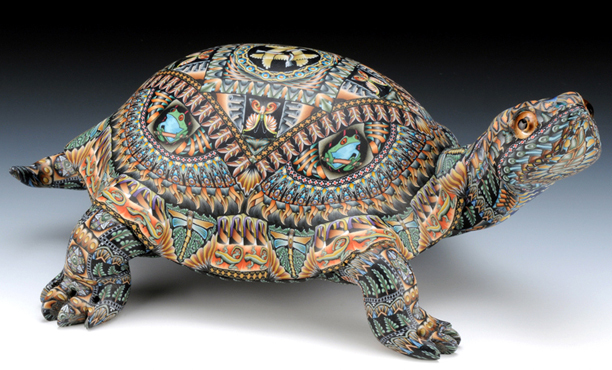 Turtle can grant us long life, wisdom, and the good health that comes from an honest and focused mind.